Nearest airports to the Camargue: Nîmes, Marseille Provence. Route via A 26 > Lyon > A7, then via Arles or Nimes. Few areas of France are as distictive as the Camargue; and apart from dramatic mountain areas, few are as interesting and offer such a range of ourdoor activities. Bird-watching, horse riding, pony-trekking for all (no experience needed), equestrian events, hiking, cycling, riverboat trips, some wonderful and remote Mediterranean beaches, and a world-famous gypsy pilgrimage each year in May; the Camargue has all this, and more. The Camargue Natural Park area, which includes a large UNESCO designated biosphere reserve, can be visited at any time of the year, but the best times are in the Spring and the Autumn, when the park's wetlands are a major staging point for hundreds of thousands of migrating birds. 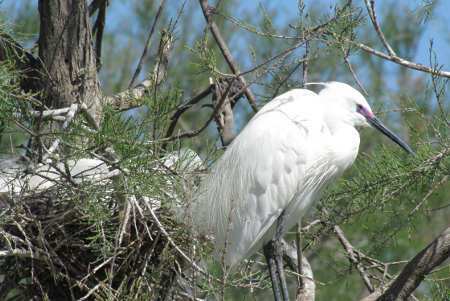 It is notably at this time of the year that the Camargue attracts bird-watchers from all over Europe. But visitors come to the area throughout the year to admire its wildlife, and in particular the thousands of pink flamingos. These can be admired on many of the park's shallow expanses of water, but most easily in the Camargue ornithological park, a bird park just north of Saintes Marie de la Mer. The centre, with its kilometres of trails, is home to many varieties of waterfowl, including flamingos, white egrets and herons; it also has a bird hospital. While the flamingos are the Camargue's most emblematic birds, the area is more historically famous for its white horses. The Camargue's horses are a special breed, reputedly one of the oldest breeds of horses in the world, and they have lived in the very particular environment of the Camargues saline wetlands for thousands of years. While some live in semi-wild conditions, most are now used either by the Camargue's traditional cowboys, for herding and rounding up the area's distinctive black bulls, or else for pony trekking. 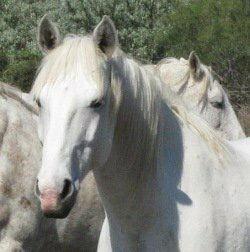 There are plenty of opportunities for horse riding in the Camargue, with riding stables beside many roads, particularly around Les Saintes Marie de la Mer. Most of these stables cater largely for tourists, and will take anyone out on a trek across the fields or the salt marshes – no experience needed. Rates are cheap - 15 € an hour in some stables in 2013, 20 € for an hour and a half. Often it's just a question of turn up and go - or book, and come back for the next available ride. 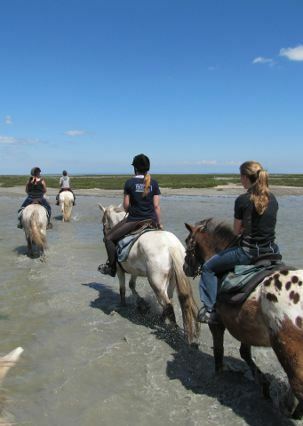 Many stables also run half-day treks and day treks, but it is best to check out with the local tourist office in advance, and book ahead; this is particularly recommended for experienced riders who are looking for more than just a wander round the Camargue at walking pace. Hiking, cycling and beaches - The Camargue offers great hiking and cycling opportunities for those who like flat terrain and no hills. There are tracks and trails across the Rhone delta. To the east of Saintes Marie, there are miles of largely deserted sandy beaches, only accessible along tracks or on foot, on horseback or bike. Some places are accessible by car, but not all. Bullfights and bull runs: Camargue bullfights - courses camarguaises - are not like Spanish bullfights. Camargue bullfights are a competition of agility between men dressed in white, and black bulls; the aim is for the bullfighters to steal the trophies, such as ribbons and tassles and rosettes, that are placed between the bull's horns. In the Camargue tradition of bullfighting, there are no matadors, and the bulls are not killed. However Spanish-style bullfighting is also popular around the Camargue area, with major classic bullfighting events in the Arenas at Nimes and Arles. Salt and rice : Apart from its bulls and its horses, the Camargue is also famous for its salt and its rice. Rice has been produced in the Camargue since the Middle Ages, and today there are some 200 rice producers and over 20,000 hectares of rice paddies in this small area, representing about 5% of rice production in Europe; furthermore, production in on the increase. Camargue's unique "red rice" is a popular local souvenir. For an unusual trip, take the D36 road south from Arles, on the west bank of the Rhone. the journey will take you through rice paddies and marshes, down to the salt pans and salt mountains south of the village of Salin de Giraud. South of Salin de Giraud, after the salt mountains, after the wetlands, the road - now D36D - just peters out on an often-but-not-always lonely bit of beach, where it can go no further. Aigues Mortes - On the western edge of the Camargue area lies the remarkable walled city of Aigues Mortes. In medieval times, this was the Mediterranean port from which the Crusaders set out, and it was on the coast. Since then, the Rhone delta has silted up, and Aigues Mortes is five miles inland, rising up out of the marshes. Aigues-Mortes is one of the finest walled cities in France, and it is possible to walk round the old city walls, which are largely intact. The ramparts are floodlit at night. Rhone river trips Just outside Saintes Marie, there are cruises on the Petit Rhône river, on board the Tiki, made up to look like a Mississippi paddle steamer. This link lists accommodation in order of distance from Saintes Marie de la Mer, from nearest to furthest (35 km). There are tourist information offices in Arles and Les Saintes Marie de la Mer. While there are a fair number of hotels and bed and breakfasts in the Camargue park area, notably in Saintes Marie, they are mostly small establishments Click here for details. Booking ahead is recommended, and is virtually essential in the tourist season. For larger hotels, including many larger chain hotels (Ibis, Kyriad, Campanile etc. ) the nearest palce to stay is in the town of Arles, at the northern edge of the Camargue park area.